I love learning what the name is for the male and female of each animal, some are obvious, others not so much. Let’s see which one the guinea pigs are. Q: What are a male and female guinea pig called? 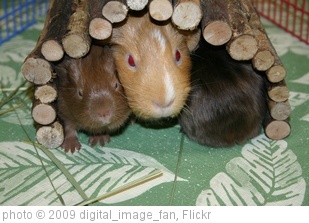 A: Adult guinea pigs have the same gender names as pigs- a male is a boar and a female is a sow. But baby guinea pigs aren’t called piglets. They are called pups. If you left the right answer, you get an entry into the April Pet Pop Quiz and Contest. Be sure to stop by next Monday for another chance to get an entry into the April contest.